Dear yogis, please stay safe! A Virginia yogini was arrested on trespassing charges yesterday in the District of Columbia after performing yoga in the DC Metro Rail tracks late last year. Surveillance video shows her climbing down onto the tracks with a friend to take pictures while the third rail was electrified. Video shows the unidentified woman and a man climbing down onto the tracks, where she proceeds to perform yoga asanas while he takes photos. She performed a seated posture, Dancer's Pose (where she stumbled and almost fell onto the third rail), and finally a handstand. After climbing out of the tracks, the man and woman were confronted by an employee of the DC Metro, then hopped on the next train. 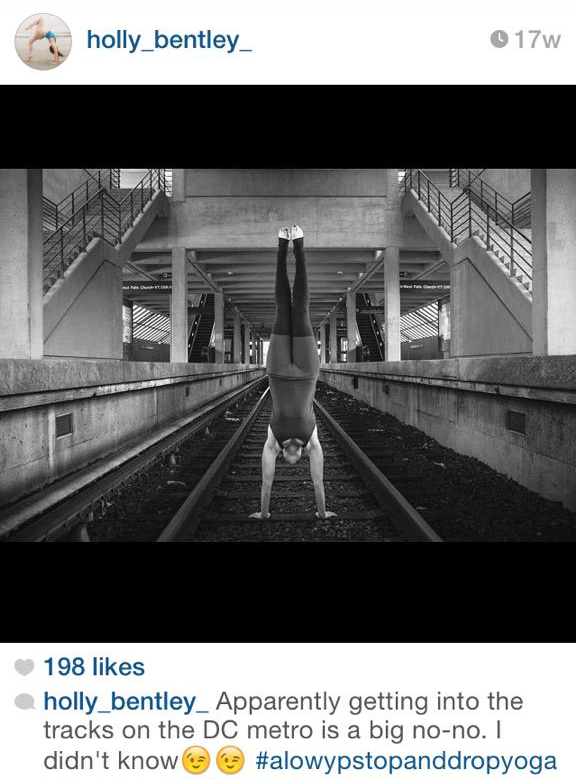 The woman uploaded a photo of her handstand to Instagram, but it has since been taken down. This story is part of a larger report by the DC Area NBC news team about people climbing onto active, electrified Metro tracks in order to retrieve lost items, or even to cross the tracks. We all love an awesome Instagram shot, but no picture is worth putting your life in danger. The third rail on train tracks is electrified at 750 volts, which could kill you immediately. Not to mention that the Metro was definitely in service at the time. There are plenty of awesome outdoor places to practice and photograph yoga poses, and if you really want to get that awesome shot on railway tracks, there are lots of places with abandoned rails you can visit. So the next time you want to get that perfect photo, check out local parks, a building with particularly awesome architecture, or a nice beach. We like having happy and healthy yogis around. No Instagram photo or challenge is worth injury, death, or arrest. Please yogis, choose your photo locations wisely!